Also, sorry for the bad scan. Yikes that's scary! Wow, Mike! Holy cow, Mike. Beautiful work, the values are just blowing me away here. Great scowl. holy crap, dude! that's awesome! My word verification is "evoll". How apt. Have always loved Torpedo, looks great really looking forward to the rest of the week! That's class man. A lot of freakin' work like. Great work, as usual, Mike. You've consistently set the bar high for the rest of of...3 weeks and going strong! TORPEDO, and in fact Jordi Bernet, are favorites of mine so hopefully that shows here. Bernet is one of my biggest influences of my early work, and continues to have a say in how I draw now. really really really nice, sir. DANG! I feel like I have been hit with an iron fist in my face! Gorgeous washes and perspective, Mike. SOmehow I really love how the "white" blood fades out in the sidewalk cracks. Mike, Mike Mike. Next week, maybe you should put a little more effort in. Man, this is incredible. The varying tones and just the clean but corrupt style is absolutely stunning. Couldn't be more impressed and more intimidated. Hawthorne, always startin' us strong! This thing has so much attitude! A brilliant piece Mike - feel like we're spying on this sordid scene from a first floor window. Not only is this this an awesome piece but you guys have picked a character I totally love to read! I believe Dynamite is re releasing Torpedo in hard cover. Btw. I love the blood running down the cracks in the cobblestones! Wow, cool Mike! Great take on the character! And you picked an angle Bernet would never do. Are you just daring everyone else? Wow. Friggin amazing; love the downshot, and the values are excellent! Great idea, love the perspective, everything works. This is b-a-n-a-n-a-s! Bananas awesome that is! The perspective on this is absolutely killer, and I love the blood effect washing through the brick. Really excellent piece of art. DAMN! I turn my back for a minute and you cranked out a DOPE Torpedo piece! 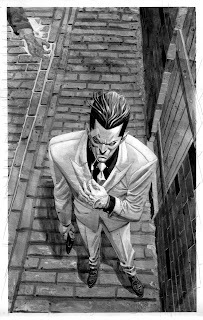 love the brick work and the different tones you reached with the inks/ink wash? It's actually a mix of water color and acrylic.